With slowly chiming piano chords, an impossibly high sustained note on the accordion, and a melody of the utmost loveliness on alto clarinet, the achingly beautiful “Walking by Flashpoint”, the opening track of The Thompson Fields, welcomes you into a sound-world of rare eloquence. 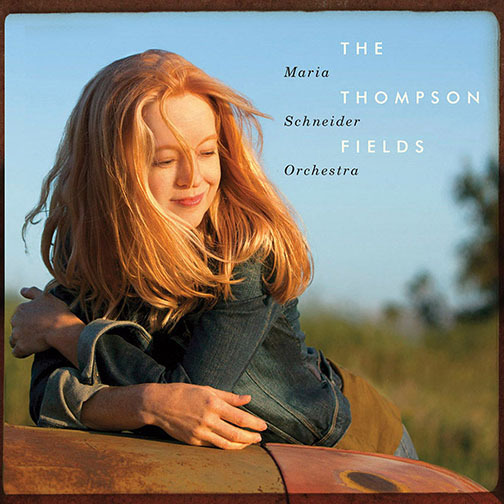 Presenting eight new pieces written by the composer, arranger and bandleader Maria Schneider for her renowned 18-piece jazz orchestra, the ensemble's first outing since the superb Sky Blue (2007), the album celebrates its composer's love of her childhood home in southwest Minnesota. Entirely funded by Schneider's ArtistShare fan base, the CD package – with its maps, photos and illustrations – is a work of art in itself. In some alchemical way, the orchestra appears to feel pulse, phrasing, dynamics and texture as if it is one living, breathing organism. As well as the impressive ensemble work, this is a band of stellar soloists too, as evidenced by trombonist Marshall Gilkes and flugel player Greg Gisbert in “The Monarch and the Milkweed”. With more transfixing solos from Donny McCaslin on tenor and Scott Robinson on bari sax, “Arbiters of Evolution” highlights that, in full flow, nobody does "ecstatic" quite like this band.